Are you looking for the house of your dreams? The Mediterranean climate makes Cumbre del Sol Residential Resort the perfect place to live all year long. Enjoy spectacular sea views from your own terrace in our luxury villas and apartment developments. There are many aspects to consider when buying a new home that will become the perfect home for you. The location of the property and the environment in which it is located are very important, but design and quality are key aspects. For this reason, the properties we offer you are of the highest quality and are specially designed to make the most of the Mediterranean climate. Over the past few years, technology has made great advances and changes allowing us to manage various aspects of our daily lives from our smartphone or tablet. This technological evolution has been reflected in all areas and the real estate market has not been left behind. More and more homes now have a home automation system that allows you to control various aspects of the home from a single device. At VAPF we pay special attention to the satisfaction of all your needs, which is why, in addition to taking care of the quality and design of our homes, we integrate new technologies into your home to make your new life on the Costa Blanca much easier and more comfortable. Are you looking for an apartment next to the sea, with every comfort you could want? In addition to their exclusive location on the Costa Blanca and their incredible views of the Mediterranean Sea, our Blue Infinity luxury apartments feature a complete home automation system. 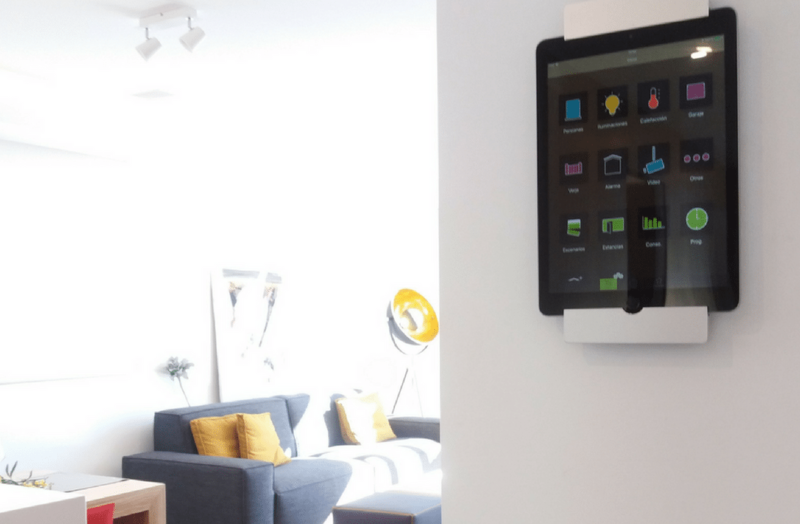 This system offers you multiple advantages and allows you to easily control different functions of your home even without being there! This system focuses on four aspects: comfort, saving energy, technical and personal security, and communication. The installed system is connected to sensors that allow you to open and close the blinds through the application installed on your smartphone, even if you are not in the same room or at home. You can also control the lighting system of your home through the application and therefore switch the lights on or off or open and close the blinds when you want and from wherever you want. This high-tech system allows you to comfortably control many aspects of your home and furthermore save energy. For example, with the home automation system you can adjust the temperature of the underfloor heating and the air conditioning of every room to be comfortable at all times at home or make sure it is always the right temperature when you arrive. Another great advantage of the home automation system is that it offers you greater security. It is very important that you feel safe at home, which is why the system includes various safety features such as: fire detectors, flood sensors in the kitchen and the bathroom, and a central alarm. Our Blue Infinity apartments with the integrated home automation system offer you everything you need to enjoy your new life on the Costa Blanca to the fullest. If you want to live in one of our “intelligent apartments”, don’t hesitate to ask for more information by filling in our contact form. We will be delighted to help you solve of all your questions and find your new home.